- Tea light, Votive candle or flameless LED candle for your Ideal use. 1. Following the steps, the crystal candleholders need to be installed easily. 2. Please clean the candleholders with a soft, dry cloth. 3. 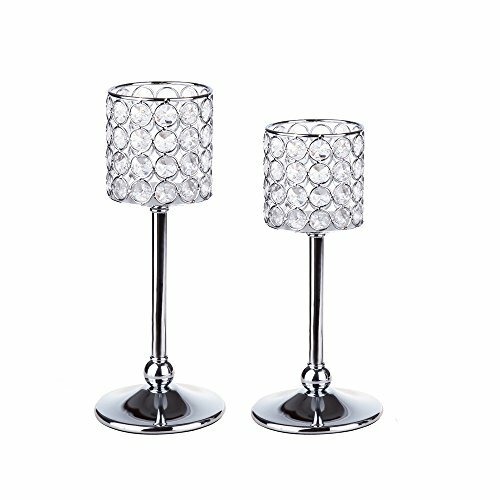 The crystal candleholders usage for tea light or flameless LED candle. 4. Please be ware of fire and candle safety rules. 5. Slightly to open the package because of the Crystal. Candle Types: Flameless LED candle or Candle. Colorful Led Candle is much shinny and bright. Design & Multipurpose: Perfect for Wedding Centerpieces, Anniversaries, Exquisite Gift, Special Occasions Celebration, Romantic Candlelit Banquet, Festival Ambience, Attractive House Decoration.